Bathing a newborn is like learning to drive a stick shift. Actually, anything with your first baby is like learning to drive a stick shift. Everything feels so awkward at first, but soon, it will all come together. In a few weeks, you'll be able to do these tasks without even thinking about all the individual steps. And once you’ve become a natural, you’ll completely forget how daunting the task was to start with…which is why no one explains ‘basic’ things to new parents like how to change a diaper or bathe a newborn. It’s not that it’s an easy job…it’s just that they’ve forgotten how hard it is. Forgetfulness is one of the mixed blessings of parenthood! When you are bathing a newborn, smile, sing a song, and talk to her. Remaining calm and talking to your baby helps her to feel safe with you. Talking to baby while you care for her is also a stress release for you, and is very bonding. You don't need to rehearse anything amazing to say to baby...just tell her what you're doing in a calm and gentle voice. Name her body parts, sing a rhyme if you remember one...just have fun and enjoy it, even if she doesn't. Even if baby cries through the first few baths...she'll eventually love them! Put baby down some place safe (like the swing or crib) so that you can use both hands and get everything ready. 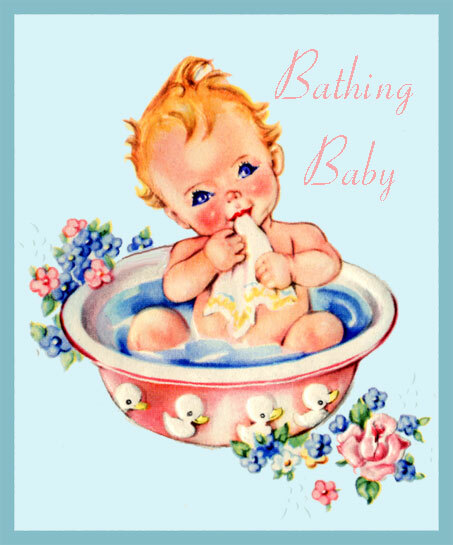 If you can, bathe baby at time when she is most happy and alert, which is usally right after a morning feeding. Before bedtime baths are nice as well, but they work better when baby is a little older and happier in the evenings. -extra gentle and smell-goodie baby soap in a pump bottle or bar so you can manage it one-handed. · and maybe for you as well, depending on how this goes! Now it is time to fill the tub. I do love my baby tub, as it has a little ledge for bathing a newborn that's just right for their tiny heiney to sit on. This keeps you from having to physically hold them up out of the water. The mesh bath seats with the netting stretched over a frame are pretty useless in my opinion, as the baby just slides right down into the tub. So if you can find one, get a tub with a little hot tub seat for bathing a newborn. Fill your tub or sink with about 6-8 inches of warm water. Be sure to test it with your wrist before dunking baby in. It should be just right Goldilocks…not too hot and not too cold. Your bathroom should now be as steamy as a sauna. Now you are ready to go get the baby! Undress baby on the folded towel and put dirty clothes and diaper to the side. Unfold the towel that you'll dry baby with, and lay it out so that the wet baby can be place right into it after the bath. Place your baby in the tub. Try to keep baby warm, secure, and happy. Soak the full sized washcloth in the water and lay it over baby’s tummy just to keep her warm. Don't wet the baby’s head first! This is habit for most of us when we shower, but a wet head is a cold head, so we’ll do that last. Use the little cup to pour warm water over the baby periodically to keep the washcloth warm. I prefer to wash baby with my hands, but use a washcloth for part or all of the bath if you’d like. Soap up your hand or washcloth, and start washing the feet, legs and bootie. Get into all the cracks and crevices. Then move to the tummy, arms and hands, rinsing as you go with your cup. Now for the stinkiest part of a baby: the neck. Sit baby straight up and support their back if you can to let their neck tip back slightly. This position really helps you get all the cracks and crevices clean. Rinse with your wet washcloth or your cup. When baby is old enough to hold her head up, you may find that she arches her back and looks up when you lean her forward. This is a great trick to get to all of those stinky little neck folds clean. Now shift your baby onto your front hand and let them lean forward further so that you can wash the back and bootie (you’ll have to raise them up a bit to do this). Now it’s time for the face and hair. This should be the last step in bathing a newborn, as it may upset baby the most. Wash the babies face, and wipe her eyes gently with just your wet hand. Wash behind the ears (you knew I was going to say that, didn’t you?!) Finally, use the cup to pour water backwards over their hair…or where the hair will be :) Soap and rinse being careful to pour the water so that it runs away from their face. Now it's time to dry off! Lift baby onto the opened towel and wrap up quickly. Dry baby's face first with a corner of the towel. Get your baby dry and warm. Pick up baby while she is wrapped in the towel and snuggle and rock her as you rub her dry. Put baby down and open bottom half of towel. Insert clean diaper #1 under the bum region. Warm lotion between your palms and proceed to lotion and pamper as needed. I like to keep the top half wrapped warmly as I lotion, diaper, and dress as much as I can of the bottom half. Unwrap the top half of the baby and finish pampering and dressing. After bathing a newborn, and during diaper changes, I highly recommend using a bit of powder in the neck crevices to keep things dry and smelling good. Ask Addie anything...just e-mail me here! Looking for more useful articles like Bathing a Newborn? Click the link to return to the baby tips and articles page.